Moses Legal Search is a premier legal recruiting firm based in Austin, Texas. The company’s talent officers find the perfect match between lawyers and employers for legal careers. 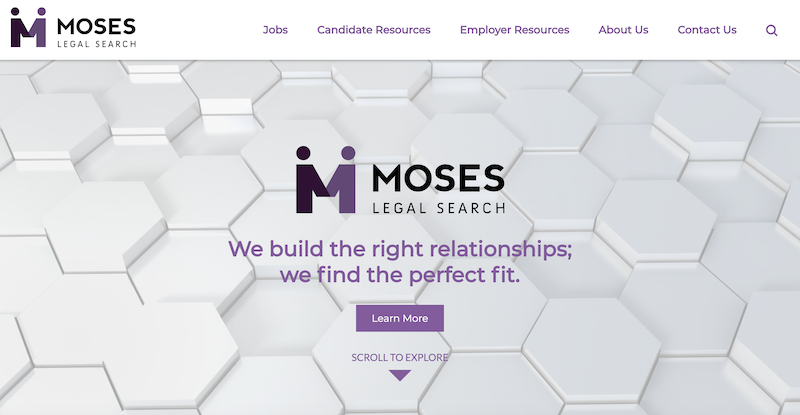 With over 15 years of experience, Moses Legal has been cultivating relationships, networking and building and expanding an extensive database of candidates and clients. The firm offers key career opportunities by top law firms and corporations (to attorney candidates) in all practice areas throughout the United States. Enhance the user experience with improved web navigation and organization of job entries. Reflect the professional image of the firm on the site through updated messaging and styling. Create an engaging website that is responsive and grabs users’ initial attention. Improve the overall look and feel to convey a current and modern design. We are thrilled to have partnered with Moses Legal Search and invite you to take a look at the redesigned website here.